Ecco Bridge/Platinum Disc sets are Region 1 (USA) and 4 (AUS) and contain up to 5 channels of sound. These sets join Season 3 and 4 together to make one season called Season 3. They don�t have any special features. Network sets are Region 2 (UK) these sets have the highest picture quality being in PAL format. They also have special features that are not on any other set. They have 2 channels of sound. These sets join Season 3 and 4 together to make one season called Season 3. Alliance sets are Region 1 (CAN/USA) they are the official release's and have slightly higher picture quality than Ecco Bridge/Platinum Disc sets but only have 2 channels of sound. They also contain commentary on some episodes. Alliance has 4 box sets one for each season. 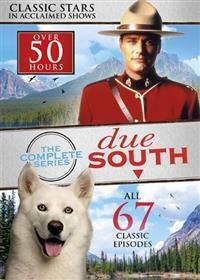 Due South is a Canadian-made television program produced by Alliance Communications. The show originally debuted as a made-for-television movie, but when the Pilot episode earned better ratings than expected, the networks decided turn it into a new drama series. 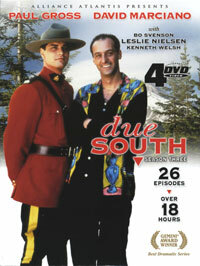 due South began its first season on CBS in the Fall of 1994, and was the first Canadian-made series to earn a prime-time slot on a major U.S. network. 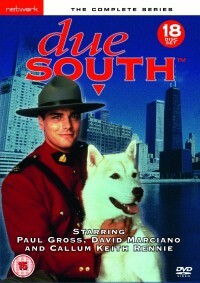 The show began with a 'fish out of water' premise as Constable Benton Fraser of the Royal Canadian Mounted Police begins his new assignment at the Canadian Consulate in Chicago, Illinois. How did Fraser arrive at such a post you ask? Well that's kind of a long story, and it takes exactly two hours to tell (the Pilot Movie). It's pretty safe to say that Fraser is not exactly accustomed to city life. In fact, his previous post was in a very remote part of the Northwest Territories. 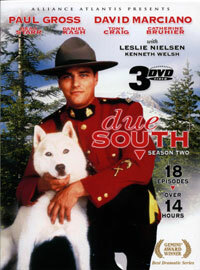 Coming with Fraser to the United States is Diefenbaker, a deaf, lip-reading (self-taught, of course) wolf. Diefenbaker saved Fraser's life in the past by dragging him out of the frigid waters of Prince Rupert Sound. Starting with the third season, things changed a bit. Detective Ray Vecchio was written out of the show as he was sent deep undercover with the mob in Las Vegas. To cover the switch another Chicago detective, Stanley Kowalski, was brought in to pretend to be Ray Vecchio. Diefenbaker also got a new look when a new dog was brought in to play the wolf. Detective Huey received a new partner to replace Louis Gardino who was killed in season 2. 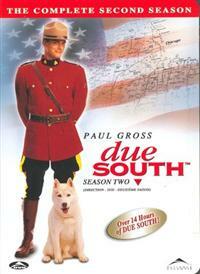 Elaine leaves the show early in season 3 when she graduates from the Police Academy and moves on to another precinct. To take Elaine's place, Francesca Vecchio takes over the position. 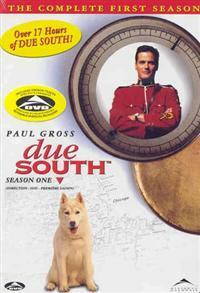 Due South has had a rocky life. CBS cancelled the series after the first season. 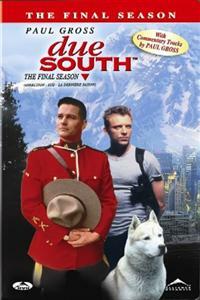 Due to its success in Canada, Alliance fought to keep it alive and managed to come up with enough money to fund another season. The show got a second chance in the United States when CBS's 1995 fall line-up bombed and the network ordered more episodes. Unfortunately disaster struck again when CBS refused to renew the series for a second time in 1996. Just when it looked like the show was done for good, Alliance was able to secure funding for a third season, thanks largely from contributions from international sources. 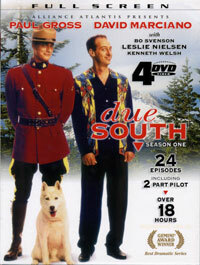 Due South, while technically a drama, is full of comedic moments thanks to the different styles of the main characters. There are also lots of inside jokes in the show; just look at many of the character's names. 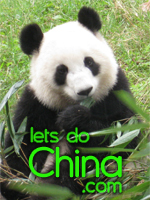 The show also explores some of the stereotypes that exist between Canada and the United States and tends to poke fun at them. They Eat Horses Don't They? 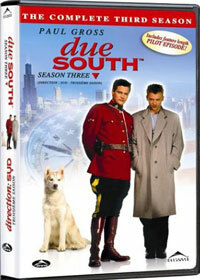 For other Due South merchandise and information, please visit William and Elyse's Due South Site. Offer 3: ALL 4 Alliance Seasons (Region 1) in 4 box sets plus Free Express Post (if paying by Direct Deposit) for $189.99 Save 20% !